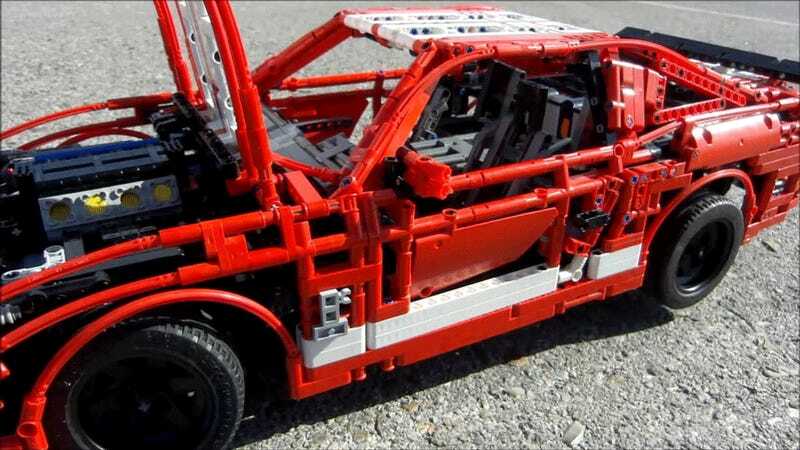 In the future, all of our cars and their associated components will be Lego-based. We'll have an entire generation of engineers raised on Legos who grew to develop amazing skills like master builder Sheepo, whose latest project is a working Shelby GT500 made of 3,500 Lego parts. Despite being just one eighth the size of the real thing, this hopped-up Lego Mustang is actually more sophisticated than some actual cars I have owned. The folks at Mustangs Daily have the scoop on Sheepo's latest creation. Sheepo says it has five different motors which operate various moving parts including the fake V8 piston engine, the steering, the sequential gearbox and four-wheel disc brakes. Beyond the mechanical stuff, the Lego GT500 also boasts a complete set of bodywork with opening doors, trunk and hood — the front seats even fold down to give the little Lego people access to the back. It's even got a suspension which imitates the real-life GT500, meaning McPherson front struts and a 4-link rear live axle. It even has a gear indicator between its seats. How about that? It's an amazing achievement by this Lego master, and by no means his first. Because he has excellent and rather Jalop-tastic taste in cars, he's also built a Lego Caterham Seven, a Lego Land Rover Defender, and a Lego classic Mini Cooper. Best use of Legos ever? I'm gonna go with yes.